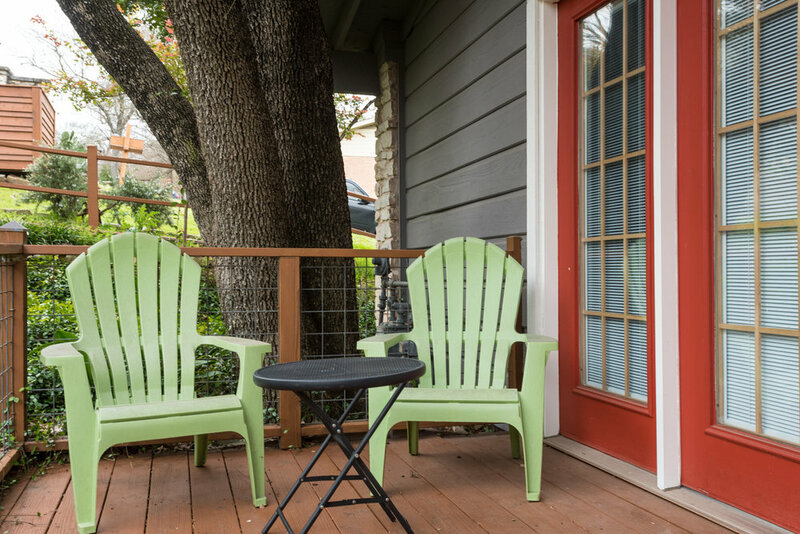 We call this property The Traveler because we realize that folks travel from all over the world to com visit Austin, and we wanted to provide a theme that might just make you feel right at home. 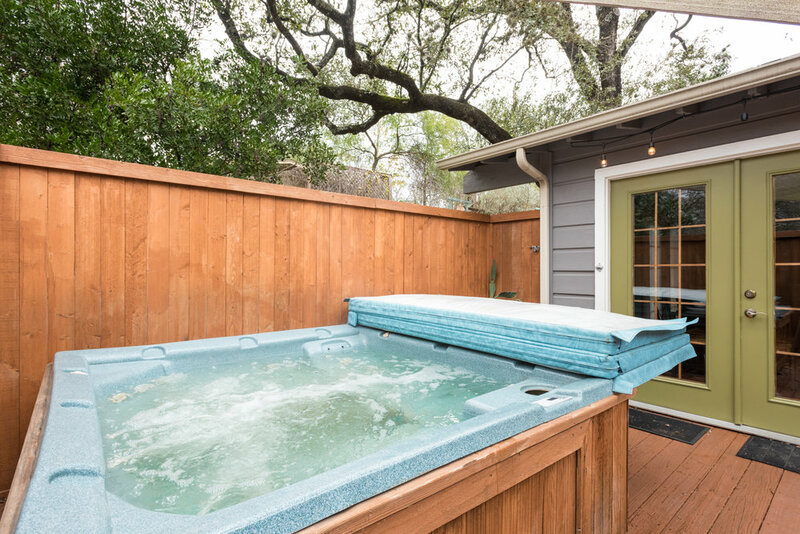 This lovely two bedroom, one bath duplex features a king bed, queen bed, private hot tub, and lots of patio space to enjoy the weather. Zilker Park is just about a mile and a half or so away, and downtown is just 3 miles. You walk into the living/dining area and we have a new sofa (summer 2017) and two really comfy sofa chairs around a custom made coffee table by renowned furniture maker David Marsh. 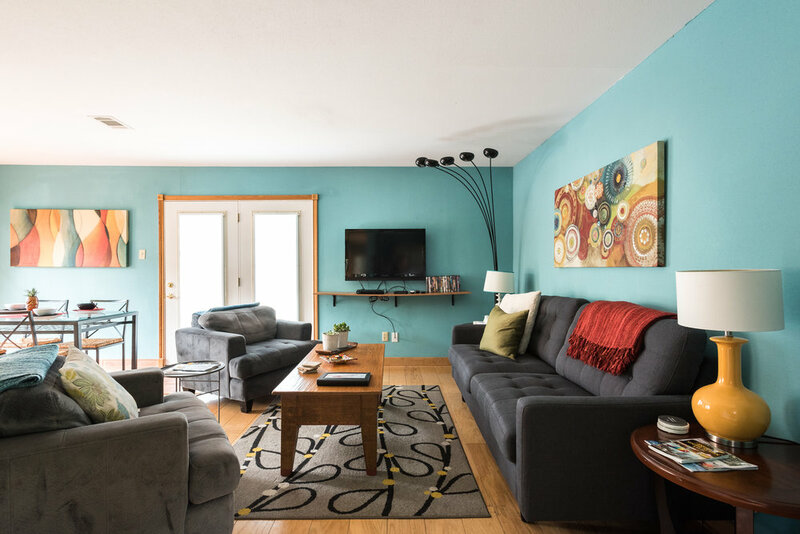 There is a large flat screen TV on the wall that is hooked up to Google Fiber TV - which acts just like your premium cable service you might be used to. The patio opens up from the dining area to the hot tub and grill. There is also seating for outside dining as well. The kitchen is fully equipped with everything you'd need to cook more or less anything you can think of. The oven/stove is electric. There is a dishwasher and filtered water and ice out of the fridge. We also provide a coffee service for you with a drip coffee maker, organic coffee beans, grinder, filters, creamer and sugar. There are plenty of basic oils and spices as well for your use. The bedrooms and bathroom are down the hall, with the larger king bedroom to the right, which has a flat screen TV and also a large walk in closet. 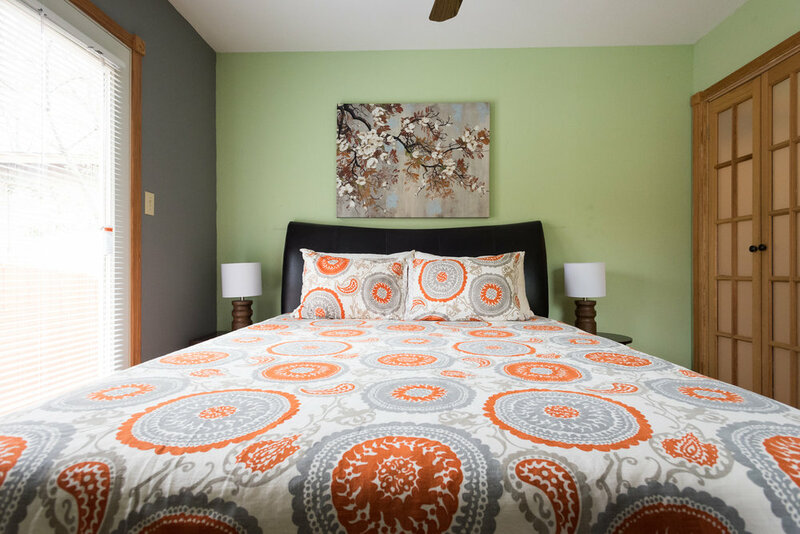 The queen bedroom has a door to the little side patio and fenced side yard - which is a really nice shady area to let your pup out to use the bathroom should you be traveling with your furry companion. This property is pet friendly with a $50 pet fee. We are located just one block west of South Lamar so there's tons of wonderful restaurants, juice bars, taco houses, bars, book shops, and even a gallery (Art on 5th) with the largest collection of original Dr Seuss drawings - all within a short walking distance. You can walk around the block to the Barton Creek Greenbelt - there's a neighborhood entrance on Crestvale Dr. just off Rae Dell. Getting downtown with Uber or Lyft is the easiest way to do it - since parking is a bummer down there. It's roughly $10-15 fare. Parking is all done on the curb right by the front door. It's not a busy street so there's always easy free parking! 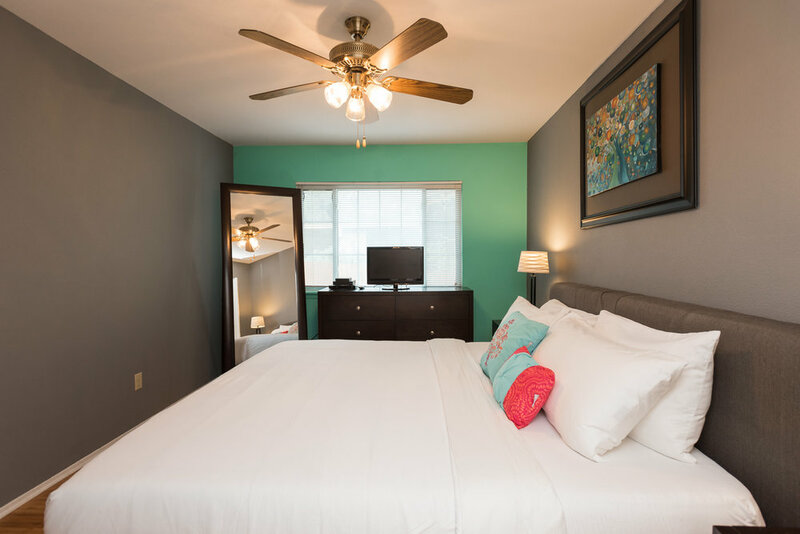 NOTE: This property is next door to Austinite Unit A and Austinite Unit B - which are two similar units so if you have a larger group we have plenty of room available! We also have The Westrock - which is a 3/2 house around the corner!